Wind down in this seriously chic pied-a-terre. Located right in the heart of the city centre, just a haggis’ throw from Edinburgh Castle, this magnificent three bedroom apartment is fully equipped for a memorable visit to Edinburgh. Every whim is catered for, from a complimentary food pack on arrival to a games room complete with Xbox and a library of games. The décor throughout is cool, calm and collected, and is split over two levels, giving a contemporary twist to a traditional Georgian property. Guests are invited to sit back and relax in the serene living room, with leather sofas, feature fireplace and comfy cushions. The large, wall mounted TV will keep guests entertained with Virgin TV and DVD player, fibre optic unlimited WiFi is available throughout the property. You’re treated to further amusements, as the property also benefits from a games room, featuring additional TV with Freeview, Xbox and games, iPod dock and board games. Screen time continues, as yet another TV with Freeview and DVD player is available in the modern kitchen. However, the focus lies on the sleek and sophisticated design of the fully fitted kitchen, complete with everything you need to complete this home from home, including dishwasher and fridge freezer with water dispenser. The large dining table can accommodate even the most royal of feasts, should you wish to rustle up your own culinary treats, or enjoy an after dinner coffee from your very own Nespresso machine. Three double bedrooms ensure a sound night’s sleep for all with homely touches and plentiful storage, and an additional single fold out bed can be set up for a seventh guest. The family bathroom is all about luxury, with thermostatic shower and separate bath, Scottish Fine Soaps toiletries and Egyptian cotton towels. This property is perfectly situated for both city centre exploration, and easy access to the rest of Edinburgh, Scotland and beyond. 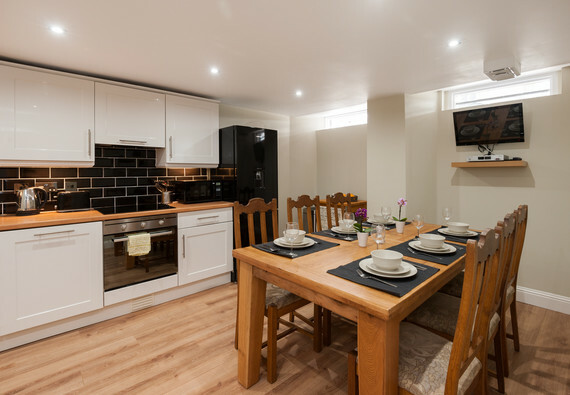 The main tourist attractions are within walking distance with the Grassmarket and Royal Mile just around the corner, and frequent public transport routes to other areas of the city pass through Lothian Road, one street away. Haymarket and Waverley railway stations are also a short walk away. Edinburgh Zoo, Murrayfield Stadium and Murrayfield Ice Rink are a short drive or bus journey away. Please note that as this property is split over two levels, it may not be suitable for disabled or elderly guests. A cot and high chair can be provided on request. Sleeping arrangements Three double beds. Many thanks for this brilliant review! I am delighted to read that you had a great experience with us and we hope to welcome you back again. Excellent Apartment. Perfect location. Lovely owner. Definitely had a big part making the weekend and more importantly the Stag loved it too. Notified me well in advance for things like final payment and deposit. Clean, well looked after, great location. Owners were very helpful and easy going.